Hard on the heels of the critically received eponymous Indie debut, Austin-based Black Bone Child roars back with, not one, but two new albums in 2010. 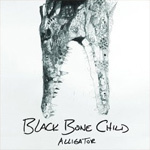 Alligator shows BBC at their best with edgy blues-based rock and roll once more. Take You Blind pulls the plug, but not the energy, with blistering acoustic performance. Releasing two discs is ambitious, yet Black Bone Child delivers on both. On Alligator, BBC attempts to invigorate their studio recording with the raw energy of live performance. They succeed quite well from beginning to end. This is rough and ready mix of blues-based rock with a steady groove which will often move you from tapping your feet or clapping your hands to working up a sweat on the dance floor. Black Bone Child has a singular ability to marry rugged catchy lyrics with amounts of grit and groove in their arrangements. Be Your Man, You Oughta Know, Turn It Up, and Devil's Teeth are a short list of rocking BBC numbers on Alligator. Take You Blind is a departure from Alligator, but the apple does not fall far from the tree. If anything the enthusiasm and energy of Take You Blind has BBC putting the knobs to eleven. Without the electric benefits, these acoustic versions with guitar, Dobro, bass, drums and more bristle with sizzling energy in their deft hands. The songs are equally soulful and bluesy, ripping and melancholy, with moments of shear brilliance on songs Dying for Your Love, Baby Baby, Mine, and The Flames are Warm. Take You Blind is genuinely inspired stuff, quite moving, and possibly even better than the Alligator disc. The good news: BBC will be performing their repertoire both ways in their future live shows as well. Bottom line: Black Bone Child's electric, and hard rocking, Alligator and the energetic acoustic set Take You Blind prove their ambition, talent and vision for great blues-based rock and roll. Very recommended! 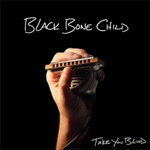 Black Bone Child's electric, and hard rocking, Alligator and the energetic acoustic set Take You Blind prove their ambition, talent and vision for great blues-based rock and roll. Very recommended!